After the invention of airplanes, but before the invention of Radar, there were a lot of interesting ways to detect incoming aircraft. It is generally known as “Acoustic Location”, and it’s fascinating. One enthusiast has made an interesting photo compilation of early attempts at the practice. 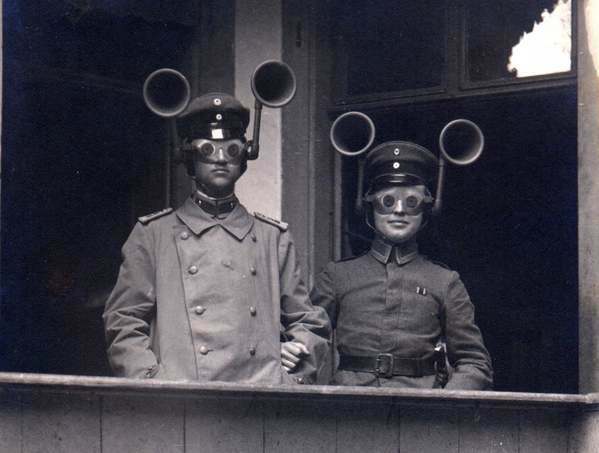 This fascinating photograph shows a junior officer and an NCO from an unidentified Feldartillerie regiment wearing combined acoustic/optical locating apparatus. This is puzzling because in Germany the anti-aircraft role was performed by the Air Service, not the artillery. The small-aperture goggles were apparently set so that when the sound was located by turning the head, the aircraft would be visible. Whether it was usual for officers and NCOs to stand arm-in arm I do not know, but it seems unlikely. I wonder what would happen if people wearing these sound-magnifiers encountered a really loud event. Probably serious hearing damage, I bet. This summer, I ran across an interesting article asking historians about how studying history has caused them to change their minds on important things. Some of the reflections are more… worthy… than others. But I found a couple particularly interesting. I’ve excerpted a couple of my favorites below (please excuse the British spelling). The Victorians, the Edwardians and the people of the early 20th century who experienced the two catastrophic world wars were all markedly different generations, affected by varied, rapid changes in society and the trauma of war. Since writing a new book, on the history of humanity’s relationship with opium, I have come to believe that the people who exist in each frame of history are completely different. The experiences of love, war, family, ageing or for instance, as with opium, addiction, are common threads, but the people are ultimately unique and individual. How we see the world, and accomplish change within it, has been changing constantly for millennia and the pace of that change will only accelerate in the future. In the next century, technology will deepen the gulf between us and those who follow to a degree previously unimaginable. And in a world where everything is ‘smart-wired’ to your subjective preference, from the cradle onwards, how does society nurture objectivity? I like this because it challenges the traditional trope of being doomed to repeat the history we don’t remember. We’ll never repeat it. It’s a different world now. I find this both comforting and disquieting. We will never go back. There probably isn’t even a back to go to. Sometimes, the change comes simply by realising you were looking in the wrong direction. Discussing when women began to buy ready-made clothing, for example, I soon became aware that everything I had been reading (and, embarrassingly, everything I had been writing) about ‘women’ had, in reality, been about middle-class women. The situation for working-class women was entirely different. But by focusing on print culture – newspapers, magazines, books – I had mentally translated their more narrow reading audience into ‘all women’. So finding new material, finding new arguments that make you read events differently is key. I can think of half a dozen moments when I have sat in the library (quietly) bouncing in my seat as a new path is opened up to me by another historian hacking through the wilderness of sources. This is a familiar feeling for anyone who has done extensive research on a topic. I’ve done it myself– I think that I’m developing a good picture of the work, when suddenly I realize that my picture is totally narrow. I’ve been looking at trees and didn’t realize that I’m in the middle of a forest.